NEW PRODUCT RELEASE! - Now with 3 wire (PWM) output which is compatible with 2 wire or 3 wire driving lights. This accessory manager let's you easily add & configure accessories without cutting any wires. It empowers you to easily fit additional lights, an air horn, accessories & emergency brake lights - making the bike safer to ride. *This product has not been certified for use in all countries. For sales outside of the USA, please use at your own risk. Integrates additional safety features such as louder horn, driving lights, aux taillights and more. The HEX ezCAN software is available for both Mac and Windows PC and is used via a micro USB cable, which is included in the package. Use Channel Mapping to select your preferred configuration. 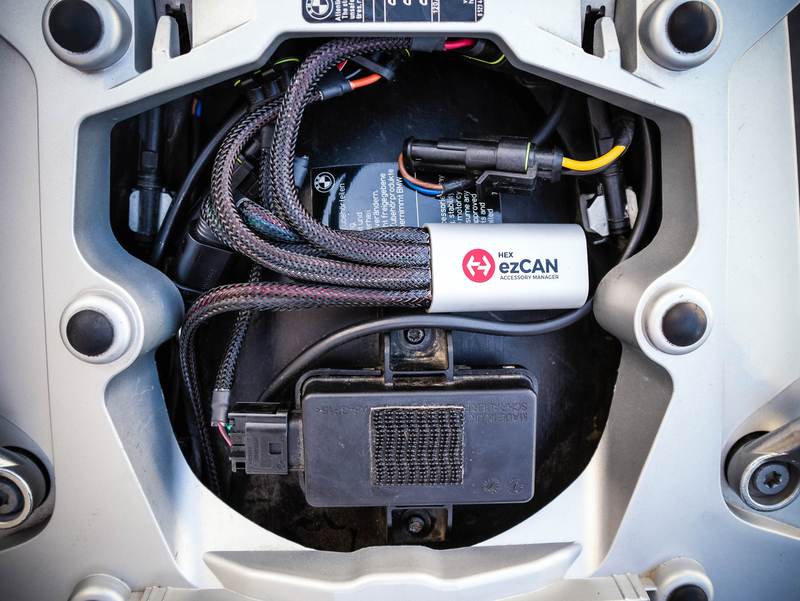 The Configuration window then lets you customize the behavior of your accessories according to CAN-Bus inputs, for example setting up an emergency brake light to flash when the ezCAN detects harsh deceleration or the LEDs to flash when the air horn is activated. Accessory/Ignition supply can be set to remain on for a specific time after the ignition is turned off. Simply works great. Easy hardware install. Programming instructions take a bit of time to learn all the options and necessary buttons to push. I purchased the HEX ezCAN last fall and installed this spring. The hardware is well made although the one small change that I think should be made is to the weatherproof plug for the USB port. The tiny, untethered plug probably will go missing very easily and, I think, would be better replaced with a cap over the whole end of the device. 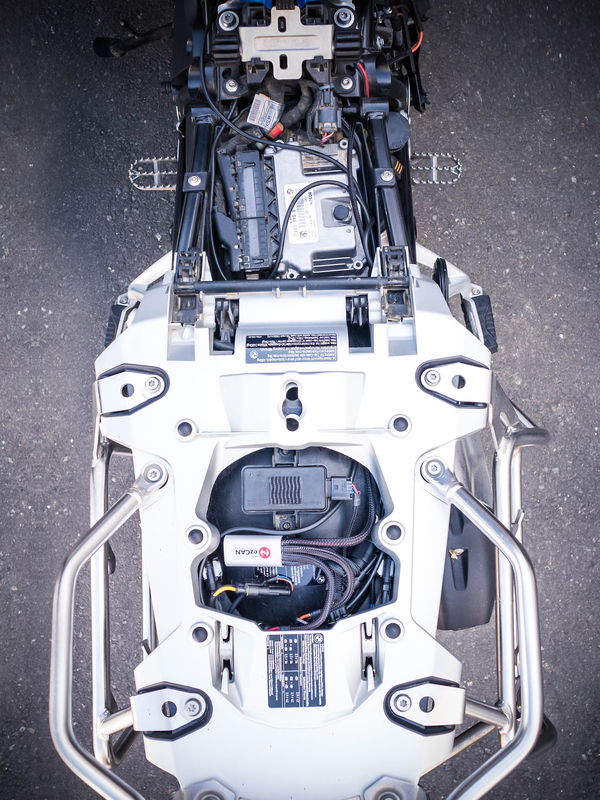 Other than that the unit is compact, the wiring and connections are well finished and the battery connections are the exact length required (no cutting and fitting). The colour coded plugs allow for easy connection/disconnection of the custom harnesses for the desired devices (horn/lights/etc.). The software development is in it's infancy and so it should only get better in the future if my 10 year experience with my GS911's holds true. One major problem is the selection of brake flashing options, particularly the California Flashing option. The software developers have chosen a 4 Hertz flash rate (4 flashes per second) for all flashing. When this flash rate is applied to the California option it results in a flash that last for one second (instead of the allowed 4 seconds). The flashing period is so brief that even if you are looking at the auxiliary brake light at the moment the brakes are applied the flash is almost imperceptible. When asked the developer feels this is just fine and that they have no plans to change. If you are a California resident and like to have a legal flashing brake light as a safety add-on I would have trouble recommending this unit if the sole purpose of purchasing is for the auxiliary brake light controls. Do I recommend the product, yes but with the stated reservations.